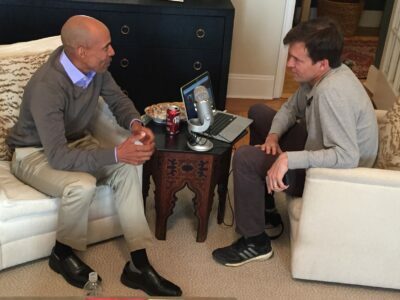 This Week’s Big Chat: Meb Keflezighi Has Got a New Book Out Called “26 Marathons”, Will There Be a 27th at the Trials? Meb Keflzighi’s amazing marathon career had 26 marathons in it and saw him win a silver medal in Athens, and titles at the New York City Marathon (2009) and the Boston Marathon (2014). He’s the only man to win New York, Boston and an Olympic medal. Meb has a new book out this week, 26 Marathons, and just glancing at it, it looks great for runners. Meb goes through each of his marathons, the good and the bad, and recaps what happened and gives advice based on what he learned. Meb literally passed LetsRun.com’s Weldon Johnson last week in Central Park while out on a run (they were going opposite directions). Meb was in town to be a speaker at an investor’s conference by Marathon Asset Management (full disclosure: Weldon’s wife did some of the PR for the event). They stopped and caught up, and Meb said he’d come on the podcast. Transcript of the talk with Meb below, edited for clarity. LRC: Alright, it’s an honor to be joined by the first live runner for the podcast. We had Floyd Landis, he’s the only other live person and he’s known for other things. Joined by Meb Keflezighi. Meb, great to see you. Meb Keflezighi: Thanks for having me. LRC: I know you’re in town for an investor conference that my wife helped do the PR for. Prior to that, I was just running in the park and there you were, going the other direction. Meb Keflezighi: Yeah. I was at Central Park running. Gotta get the anxiety out a little bit or plan ahead of what I’m gonna be talking about or run the questions in my head. I was here in New York for Marathon Asset Management, a hedge fund investment company. LRC: I secretly snuck in and heard the talk. I thought it was really good. LRC: I’ve heard runners talk before but I was kind of curious, what you guys talk about not at a running event. Your life story, I thought you did a great job. You had the little video beforehand. 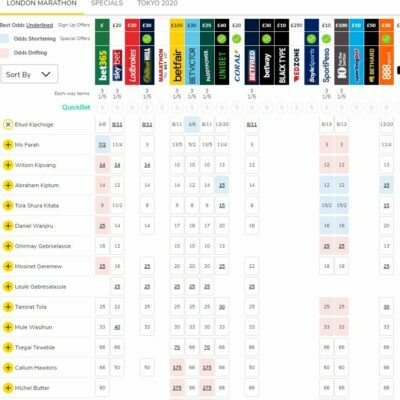 People, you wanna hire Meb, he’s well worth the money. Meb Keflezighi: Thanks. It’s an honor to be able to share stories of running, but use them in a real life experience. Sometimes with this one we did a question and answer fireside chat, but sometimes graduations, commencement speeches, things like that. It’s pretty well received as well. LRC: Also good timing. You’ve got the new book coming out next week. You can pre-order now, right? Meb Keflezighi: You can pre-order, it comes March 19th. Less than a week away now. Its called 26 Marathons. It’s a journey and memoir of all my 26 marathons what I have learned through the ups and down of the marathon. Most people say the marathon is a metaphor for life and they can see my life journey through marathons in the book. LRC: The marathon is definitely a metaphor for life. Let’s start with the book. You just handed me a copy, and I think its good that I don’t know anything about it, but I see Scott Douglas helped write it. He was involved in your last book and Scott knows running, he used to be an editor at Running Times. Now he works for Runners World, but he comes at it I think from the competitive running side of things. Talk a little bit about how this book idea came about, and the thought process behind it. Meb Keflezighi: Well, its called 26 Marathons and obviously my first marathon was in New York here in 2002. I did my first marathon, I hated it. ‘This is my first and last marathon I never wanna do ever again.’ Then I went back to my roots where I was born in Eritrea, saw how people were surviving, going to the wilderness to collect wood. They go to the wild to get water. You know what, running a marathon, that complaint that I had in the last 40 minutes was not that bad. So I came back, and tried to convince coach Larsen to put me in the Boston Marathon. 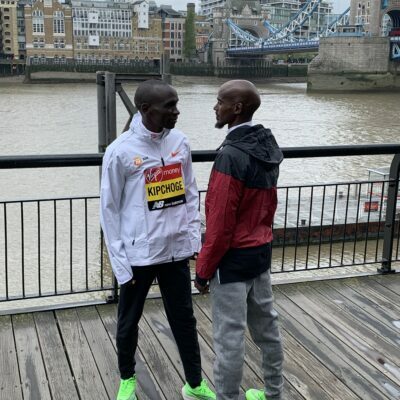 Since I ran 2:12:35 on my first marathon, I missed the A-standard by 35 seconds and he wanted to put me in a flat course, [so] I went to Chicago. In Chicago I didn’t go for the win. I always try to go for the win and see what happens, but at that race, I just went for the time and I fell in love with it because I didn’t hit the wall. The story of the book is the lessons. Sometimes, going to the Olympics Trials [you] under promise and over deliver. But things are not always gonna go your way. Even though you run a PR, you get setbacks and then you have to get back on your feet. Going to Athens, I was a 10K guy versus a marathon guy, but we had to make a decision. [Do the 10k and then] two weeks vacation, or a marathon in a hot, hilly, humid course [at the end of the Olympics]. Going to Athens and then [only being] the 39th guy in the field was [on paper] not my [best] chance to do well. You’ve gotta surround yourself with good people, train really well and smart and then go out there and execute a good plan. LRC: Its kind of crazy you’ve done 26 marathons. I would’ve said … I don’t know … I would know you’ve done more than 10, but I would say you’ve had like 10 good marathons. 26 is a lot, and it sort of shows the journey, and you’re doing it a long time. You’re only a few years younger than me, and I can’t imagine running a marathon at a competitive level. LRC: You need an encore for the book, right? You need a 27th marathon. I was glad to see you running in the park. I must admit, I didn’t notice you ’til you went by me. I don’t know how fast you were running, but I was distracted because a woman had just passed me going the other direction and I was kind of flustered. Is there any chance that you would come back and do a 27th marathon, which I think a lot of people would presume would be the Olympic Trials? Meb Keflezighi: That has always been on the back burner to be honest just because sometimes you run a lot. I love running. I have passion for running, but also, you’re supposed to follow your passion, [and] you’re supposed to do more, then have more time. Sometimes I drop the kids off at school and go for a run. At one point I was running 60-70 miles a week, six days a week. Recently, I have not been running as much. Its always interesting to think about because now its less than a year away. I’m completely happy with my career, but it’s sometimes in the back of the head [on the back] burner and you think, “Should I? Should I not?”But as of right now, no. LRC: So there’s some chance. You’re saying there’s a chance? LRC: I think we gave you like a one in 50,000 shot of winning Boston, so the odds of you coming back are higher [than that], right? I think the odds are pretty big. Meb Keflezighi: I still love to run. I know what it takes to be at that high level. Since I’ve done the New York City Marathon, I really haven’t done the work. I did one [race] somewhat just to kind of see what I can do at the Bellin Run in Green Bay [last summer]. That’s the only time I’ve probably pushed myself. At one point, early on, like January of 2018, coach Larsen wanted to ride his bike with me. I said, “Coach, no. I’m not for that. I don’t wanna make an appointment.” And he was like, “Yeah, I know but I want to ride along”. [I said] “Well if you’re gonna ride along with me, I’m gonna do a workout.” I just did a workout, I was trying to just break a five minute [mile] and see what I could do. I was gonna do four [miles], but I ended up doing six and ended up with a really fast one. He’s like, “We need you to find a race, we need to find a race”, but I’m like, “No, I’m good”. LRC: But you did six miles sub five? Is that what you said? Meb Keflezighi: Started at 4:52 [per mile] and then ended up in 4:36 on the road. LRC: In January of 2018? LRC: Its been a year. Meb Keflezighi: Its been a year. LRC: I remember seeing Hawi, maybe last year in Houston. There’d been some talk of you maybe doing that race, right? 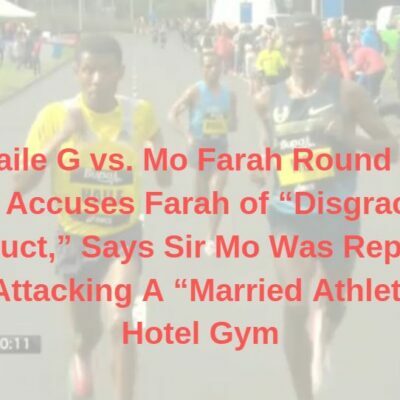 Meb Keflezighi: There was a talk about that. Marathons, they’re tough. You can’t walk the next day. You can’t walk normal for a week, so I was done. I thought about doing shorter races, like a 10k or a half marathon. New York did not go the way I wanted to go in 2017. I was like, “Oh, maybe I should jump in the half marathon for fun and see.” I got sick or something, and it didn’t happen. LRC: When’s the last time you ran a sub five minute mile? Meb Keflezighi: Last time I ran a sub five minute mile was at the Bellin Run in June. LRC: What’d you do there? Meb Keflezighi: I think I ran … literally I hadn’t done any workout’s, tempos or intervals. I just jumped in to run. I ran 31:06 or 31:08. It was pretty consistent. My good friend Jared Ward was there, and he said, “What? What? I thought you retired?” That was the last time I ran [fast]… I don’t remember the last time I’ve done sub six. Its been a while. LRC: I’m surprised guys on LetsRun weren’t critiquing that run. I didn’t even know about it. When you go run, do you just go jog? You never pick it up? You just go easy everyday. Meb Keflezighi: I go easy everyday don’t do intervals. Sometimes if somebody passes me and then wants to challenge me, I throw my competitive hat on. Sometimes, I start really slow. Sometimes eight minute, 8:20 pace and then go down to 7:30’s and then eventually by the end of the run, I probably run 6:20’s, 6:30’s. I think it was December of 2017, a couple times I broke six minutes when I was in Austin for a function. LRC: You gotta start increasing the pace, start thinking about the comeback. Everybody loves the comeback, all sports. Meb Keflezighi: Everybody’s been saying about that. LRC: The comeback is universal. Meb Keflezighi: Yeah, it is universal, but you gotta know your limits. LRC: We’ll raise money, we’ll have a charity cause or a college fund for your kids, something, crowdsource it. We need Meb back out there. Meb Keflezighi: Appreciate the support. LRC: Turning away from the 27th race, the twenty six races is in the book. Even just hearing you at the conference, what you were saying about Athens, people forget about your career. 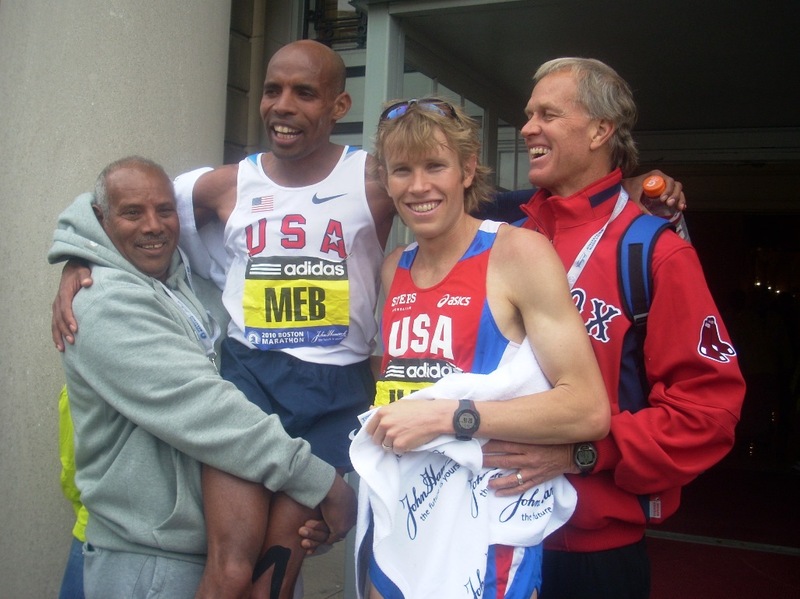 We think of Meb, the great marathoner, and you didn’t even win the Olympic Trials in 2004, yet you’re essentially a silver medallist at the Olympic Trials and silver medallistat the Olympics. Meb Keflezighi: Yeah, and then silver medal at the New York City Marathon that year, 70 days later. For me, most people know me I guess from social media as a marathon runner, but at one point I was an American record holder in the 10k. That lasted for nine years. I ran 13:11 in the 5k. That was the fourth fastest in US history at the time. Coach Larsen and I always knew that 5k, 10k training is going to make the marathon training easier, so we focus[sed] on that. I used to go back and forth and then 2009 is when I made a full commitment to marathoning. That was due to my wife actually saying, “You know what? You already got the American record, what else do you want? Is it for personal gratification to [go] under 27?” I wanted that lucrative under 27 minutes. She had a point, I said, “ You know what, I want to be able to be more of a marathoner “, and eventually just ran 1:01 in the half in San Jose. Four weeks later, I won the New York City Marathon, wearing that USA Jersey. I didn’t go to Beijing because I had a stress fracture and didn’t qualify. LRC: Yeah, I missed that one. I was not here. I was at a family function, following on my [phone] … I think streaming was kind of new on the phones then. I was like, ” He’s gonna win, what? How is this happening? I couldn’t believe it.” You missed the Olympics the year before, and had really bad injuries. Do you go into that in the book at all? Like how bad the injuries were? Meb Keflezighi: I told her, “ I think I couldn’t have come in first … [but could have gotten] silver and bronze. Bronze for sure.” I thought I would have got another bronze medal, but the silver would’ve been very possible as well. In 2009, it was revenge time, almost. The competitive me, I wanted to beat as many Olympians as I can wherer it was cross-country on the road or the marathon. LRC: 2009 was a good year for you. I didn’t realize, your wife gets credit for the New York City win. Meb Keflezighi: She’s the one who said, “Focus on the marathon. “ That, and then I have in the book, The 26th Marathon [this story]. I talk about, I woke up on September 21st or 19th [of 2009], the Great North Run was happening and then I woke up the next day, I had a dream that I won the New York City Marathon. I haven’t run San Jose half yet, and I said … I came up from downstairs and I said, “I had a dream … “, and I told her that I won the New York City Marathon. She’s like, “ Oh, that’s great.” And she goes, “ Do you know what happened at the Great North Run?” And I’m like, “ No, what happened? “ She was like, “ Martin Lel ran like 59 something, and then Gahrib was there, that he ran 59 something or 60:04 or something.” I said, “Well, I guess I should say goodbye to that dream.” It took me about two minutes later, I said “ Well, I think they peeked too soon. They have to run on November 1st. They have to be ready to run that time.” I think they peeked too soon. Meb Keflezighi: Obviously, I ended up winning. Martin Lel got injured and didn’t run the race, New York, that is. Gharib ended up being in 3rd place there, and I ended up winning the New York City Marathon. LRC: Yeah, 2:03. I was gonna say 2:04:00 or [even] 2:01:00. Its crazy. Meb Keflezighi: I think its like I said earlier, you just got to run that day. I’ve always been a competitor. It’s not like I didn’t have chances to run in London, or Chicago but the timing or the pacing was not to my … or fitness was not up to par. I always felt I could run, whether it was 2:06 or 2:05. Its just got to be the right time and my time was … the fall was always New York. I love [the] New York City Marathon, I liked it. LRC: Did you run Chicago [only] once? Meb Keflezighi: I ran once. But I[ when I ran, I just wanted to get a 2:12 [qualifier], I ended up running 2:10:03 and ended up getting 7th place. In London, I started in 2007, I was having achilles problems. I dropped out and then Haile dropped out. Stefano Baldini, who’s a gold medalist dropped out, Myself and Khalid Khannouchi [dropped out]. By the time we got to the finish line, everybody thought we ran one, two [in the race] or something. [But] We didn’t finish the race and they say, “ Congratulations.” The short answer is thank you and get away. LRC: What’s the lesson [from that one]… I need the book, where’s my copy of the book? Meb Keflezighi: Its right there. LRC: What’s the lesson for the book for that marathon? Meb Keflezighi: Cut your losses, and move forward. The reason being … the reason I stopped is, you hear achilles being very sensitive, career-ending injury. I really wanted to make another Olympic team in 2008 [at the Trials], which was held in November ’07. I wanted to not mess [up] my achilles, and save my energy and not think about making the Olympic trials and hopefully go win another medal. You can do everything right, and then [it does] not pan out the way you plan it to. LRC: This book is great, just thumbing through [it]..[Here’s a race] Boston, the year after winning New York. This is so true. Its better to be 90 percent ready and make it to the start line, than to panic and become either over-trained or unable to start the race. Running, I think in some ways, is really [just] trying not to get injured. Meb Keflezighi: We have type- A personalit[ies]. We are so meticulous about details. We are so meticulous, going that extra mile. A day off or a week off would have saved me the 2008 Olympic trials, which was held in November ’07. At any point that summer or that time, if I had taken a week off, I would’ve been okay. We are so driven, that I wanted to win. I started my New York City Marathon here. I was second place here, third place here. I’m like, “I’m due for a win here.” Obviously, it didn’t pan out the way that I depicted it. LRC: I’m on [marathon] number eight [in the book]. [You ran ] 2:22:02, Not very good there. Meb Keflezighi: What year is that? LRC: That’s my year, right? Meb Keflezighi: [In] 2005 I only had eight weeks of training, with a ruptured quad after the Helsinki World Championship. Eight weeks of training, I finished in 2:09:56. 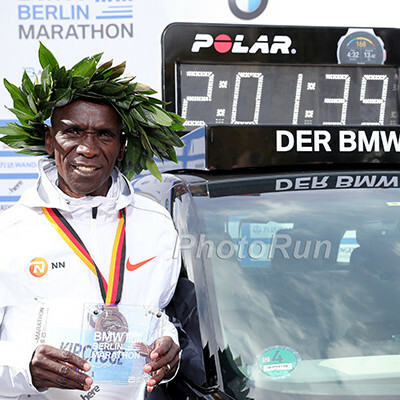 Then, 2:09:53 was my PR [at the time which was run] 70 days only after Athens, I said [in 2006], “there’s my chance … my chances of winning is gone, its over.” Obviously never short cut yourself. Never give up on your dreams. 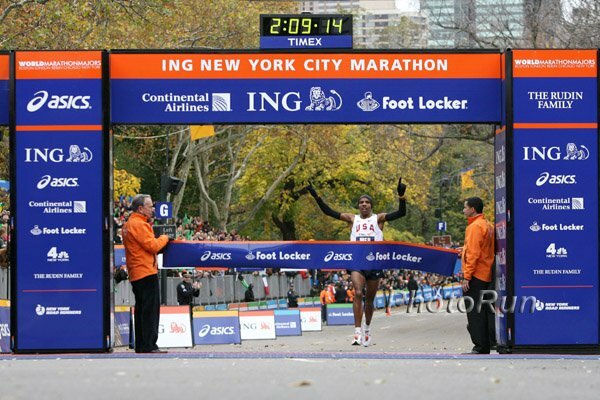 It seemed much more sweeter later on when I won the 2009 New York City Marathon. LRC: Your career is like a storybook. I think the setbacks make it even more beautiful. Your biggest victories … I would say, the medal at the Olympics, even the New York City win, the Boston win. Nobody expected any of those. You did all three. The only person to do that, medal, win Boston and [win] New York. Meb Keflezighi: I’m a student of the sport. I always said, “ Who medalled?” Frank Shorter. Did he win New York? Did he win Boston. Billy Rogers won Boston. I wanted to be like him, Win Boston. Obviously, Alberto won New York, and he did that. At one point, I said, “ Who else has done those?” One guy that did both, medal [and] wn New York. Then I’m like, “ Well, how about Boston?” That’s a personal challenge that you have. I talk about running in the marathon, but my Run to Overcome a book is all about overcoming obstacles, from poverty in Eritrea, where I ate dirt to survive. I remember just eating dirt. Something in my brain told me to eat dirt, just like something in my brain told me in the Boston Marathon at mile five, go for it. LRC: So you were a little kid and you ate dirt? Meb Keflezighi: I ate dirt. LRC: For nutrition or were you hungry? Meb Keflezighi: I was hungry. I had a really bloated stomach. I don’t know the name of it. I was the kid in the village… I was known as the guy with the bloated stomach. I was big ’cause of malnutrition. To overcome from that and to be able to [do what I did] … my dads walk from 225 miles from Eritrea to Sudan, not knowing if he was ever gonna see his family, leaving behind a wife and six kids. Sleeping in the tree because hyenas or snakes or scorpions are gonna bite you. Sleeping on a tree, like just cross on a branch, having nightmares. Things like that, those are the things that [move you]… so that’s why when you see me, when there is opportunities, I never let it waste. I’m gonna go through a lot of pain, do whatever’s necessary to make my experience with other people pleasant, or drive to that finish line at the best I can. Even if [it’s finishing in ] 2:22 I can walk there, or when I had the my Mike Cassidy story in 2013. My mind says go, my body says no. 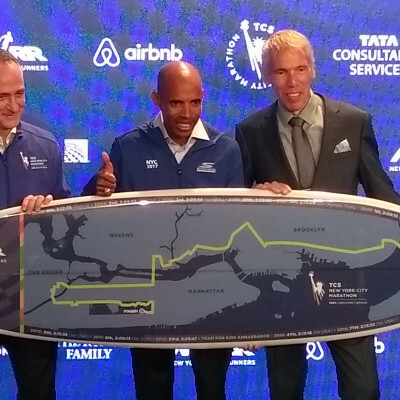 Meb Keflezighi: At that point, I knew how it felt to win New York, but I know many people during Hurricane Sandy got canceled, many people came here and didn’t get to the finish line, but I can still walk and finish. The bombing happened in 2013 in Boston. 2013 New York City Marathon was supposed to be my last marathon and retire after that. LRC: So, when’d you sign with sketchers? Meb Keflezighi: 2011. August 1st, 2011. LRC: That was through ’13, you were saying. You kinda though that would be it? Meb Keflezighi: No, we did a year-to-year, actually. Sketchers were year-to-year [at first]. They were new to running. They were doing a lot with actors. They would give a six month contract or a one year contract. Now I’m with them until 2023, so its an honor. Its been a great partnership. When I decided 2013, but because of Hurricane Sandy [cancelling NY in 2012], because of the bombing [in Boston 2013], something internally told me that, “you should keep going.” I’m glad I kept going. LRC: Even with the bombing, and then you win the next year, I really think some people mock destiny, but if anyone was destined to win this stuff, it was you. LRC: When’s the last time some did that to win a marathon? Meb Keflezighi: 99 percent [of the time] they always get caught. In the book, I talk about all the small details that you do. I did the drills 6 days a week. The stretching that you do two times a day and the foam rolling and all those things that you do nutritionally. It came in handy because sometimes you know if it’s gonna pan out the way you want to, but just stay focused, stay focused. The crowd, the people are chanting “U-S-A. U-S-A.”, doing the wave and I even got emotional. I’m like, “U-S-A. U-S-A” and I’m concentrating on the race. LRC: Breaking character there for you, Meb. Usually you’re composed. Meb Keflezighi: Obviously 36,000 other people were trying to do something positive on Boylston Street, show their resilience and persistence that we’re not gonna give up. I was just the fortunate one to be able to be in the lead. It’s by the grace of God that I was able to pull that victory, and I had the victims names on my … I wanted to have a picture under my bib and to pull it out at the end. I wrote the names [on my bid], as an elite athlete you’re not supposed to write anything on your bib, but I wrote in sharpie and it went viral when I wrote the victims names there. LRC: If somebody made a Hollywood movie on this, they wouldn’t believe it, right? LRC: You talk of possibly retiring. That was after the trials in 2007? Or before? Meb Keflezighi: In 2008, that was a big milestone and my body gave up on me, literally. I didn’t realize I had a pelvic stress fracture until 10 weeks later. LRC: Right after the race. Meb Keflezighi: Yeah, because Ryan Shay passed away. I just put my life in perspective. You know what? An injury is an injury. I saw a doctor here, he says, “Well, you know how hard Central Park is. You have a gluteus minimus injury, or spasm on it, but I’m going like this, lifting my leg up to turn in bed in pain. You know what, I’m happy with a silver medal, I’m happy with the American record. Not what I imagined when I was eating dirt as a little kid. [It was] byond ever my expectations. I though about it, yeah, just call it a day and go get a job somewhere. LRC: Your story would’ve been amazing as-is. Silver medal, American record 10k, coming from Eritrea. Your family represents the American dream. Someone should do a movie on your family. If you retire then, you’re not the Meb now. Your not traveling to New York doing speeches now. Maybe here and there, a couple running events. Do you ever think what you’d be doing now if you retired then? Meb Keflezighi: Probably down with a coaching job. Probably some kind of entrepreneur in business would’ve been always an interest of mine. Obviously, there was a big article in San Diego paper. Bryce Miller, who went to Eritrea, he asked me that question, “what would your life be, imagining you were in Eritrea?” I said, “One, would I be alive from the war? Two, I’d probably been a farmer and have cattle, but that’s not what God has planned for me.” Through the mercy of God, my dad was able to escape, and then get the family out. Eventually we came here on October 1st, 1987, which is a dream realized, a second life. Nine out of … there’s 11 of us, I have a half-sister, but nine have graduated out of college or gone beyond even masters and MBA’s and doctors and law, also. Meb Keflezighi: We came here with nothing, just the clothes on our back. Some of the bags even got lost in New York, connecting to San Diego. My parents woke us at about 4:30 in the morning to learn English with a dictionary before going to 7:30 o’clock class. My brother, when he got that trophy in 9th grade [for best student]… imagine yourself going to a different country, not speaking the language or not having an education background and placed into 9th grade. LRC: You’re saying, your older brother won top student? Meb Keflezighi: Most outstanding student at Roosevelt Jr. High. LRC: In his first year here? Meb Keflezighi: In the first year here. Meb Keflezighi: Yeah. He better get up-to-speed. LRC: What’s he doing now? I need to meet this guy. Meb Keflezighi: He’s great. He’s an electrical engineer for Texas Instruments, but he’s been with the same company, National Semi-Conductors since ’96. So 23 years. In fact, yesterday was his 50th birthday. Meb Keflezighi: So happy birthday, Fitsum. LRC: Happy birthday. That’s funny, I’ve only really met Hawi. Meb Keflezighi: Hawi, you know Fitsum and then [another has] the MBA, and then I’m the runner and then my sister, who’s a doctor from UCLA and then Hawi, law degree from UCLA. When you have good nutrition [anythin is possible], when you’re eating dirt, you barely survive. When you have good nutrition [this can happen] … I have a sister who ended up going to Stanford and graduated from Stanford. I’m proud of them. All of them have done an amazing thing. We’re just blessed for the opportunities people have given us, and chances to be part of the American Journey. LRC: Can we have like 10 minutes? Okay. LRC: Your family is totally amazing. What’s your dream job if you weren’t a runner right now? LRC: I thought you were gonna say UCLA track coach or something. Meb Keflezighi: Yeah. My roommates doing that and both my teammates. Avery Anderson is the head guy and then Devin Elizondo, who was my roommate as a freshman. My rival in high school, but roommate [in college]. Rivals one day, and then friendship the next day, roommates the next year. He’s the head coach there. LRC: He’s the head UCLA coach? Meb Keflezighi: Head cross-country coach. Meb Keflezighi: Avery, who was a football player and an all track 110 hurdles, is the head guy there. LRC: Speaking of head coach, there’s a book coming out, another book about Bob Larsen? Meb Keflezighi: Yeah. Its coming up in June, I believe. Coach Larsen has been more of a father-figure for me, more than a coach. His old days with the Jamul Toads is what the story is about. His journey … he also has very humble beginnings in Minnesota, where he grew up probably without electricity and water. That’s kind of the bonding moment that we had. Meb Keflezighi: He had farm, he had farm. LRC: He had cows. He’s ahead of you. LRC: You take your kids back to Eritrea, right? LRC: Try not to spoil them, Meb, please. Meb Keflezighi: No, not spoil them, but try to provide the best opportunity for them. Seeing their cousins and relatives in the village hopefully will trigger something for them to be good people. LRC: Speaking of birthdays, its on twitter, one of them is a teenager now? Meb Keflezighi: Yeah, I have a teenager. Sara just turned 13, and then Fiyori will be 11 here in a couple weeks, and then a nine year old. LRC: What’s your number one parenting tip for people out there? Meb Keflezighi: What you just said, don’t spoil them. I really think both my parents, and my dad, and Yordanos dad, that’s what he says. Provide things for kids, but don’t ever spoil them because if you spoil them, they feel entitlement. LRC: Yale, all of our schools are involved. Meb Keflezighi: I didn’t hear about UCLA until this morning, but I was reading a video a little bit through twitter, and I was like, “I can’t believe it.” I never occurred to me, you can do such thing. LRC: 250 grand to get into USC. LRC: That means UCLA would’ve been more, right? I just can’t believe somebody … teach your kid hard work, or give them the money. Think what they could do with that money, my goodness. Meb Keflezighi: You know, Weldon, Society is … people are paying for parenting in many ways, nowadays. I think the more we can be … I try, but, I’m not perfect. I try the best that I can. My wife does a better job than I do to be able to just keep them humble, be there for them all the time. When I’m at home, I love taking them to … walk them to school, or have a little chat and bring them from school. Obviously, my weekends are usually taken because of races or speaking engagements. Meb Keflezighi: Go outside. Go outside, instead of the tabs, phones and iPads. LRC: Do you limit your kids screen time? Meb Keflezighi: Yeah we do. There’s no TV on weekdays. That’s how we grew up, both my wife and I grew up. LRC: Unless the Boston Marathon is on, right? LRC: This is when you won? 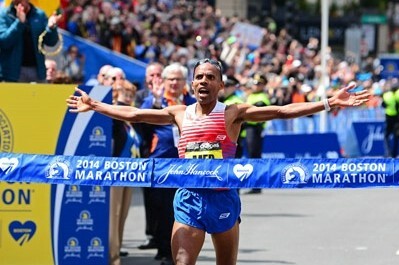 Meb Keflezighi: – In kindergarten. Yeah. 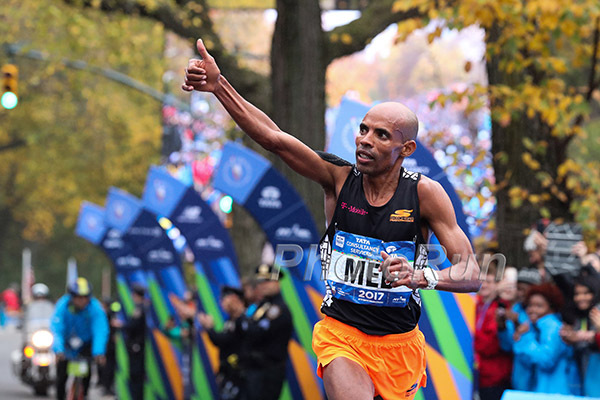 Meb Keflezighi: He told me … He was a photographer, ” I wish I could have that picture because you’re watching the TV, all of a sudden, your sitting down until it gets interesting. They just got up without anything and kind of moved a little bit toward the projector. It was a really great experience from what they told me. LRC: That’s cool, she got to see it. 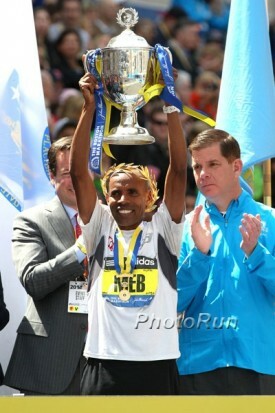 Meb Keflezighi: It was great. LRC: Your kids go to good schools, then. LRC: We should do rapid fire, kinda try to end this. I’ve got too many questions I wanna ask you. How about … I mean there’s just so many. I don’t know how I’m gonna get these in there. Meb Keflezighi: You’re gonna ask good questions, that’s what it means. LRC: Okay. Ill just go by these rapid fire … try to give quick answers. Do you have any regrets, looking back at your career? Meb Keflezighi: Yeah. I think [in the Athens Olympics with] Stefano Baldini. When I tell them … in the book I talk about 5k [to go], the great Stefano Baldini … he was in a 5k to go. I said, “[an Italian phrase to him]”, which means, lets go, one, two. I lived in Italy for a year and a half, so I throw that at him. My regret would be, I should’ve made a move, in hindsight now, just made a big move right there, instead of saying lets go catch dos Santos, I should have made a move. That was my 4th marathon. Athens was my 4th marathon ever. I didn’t have the experience … In the back of my head, Paul Tergat, a 2:04 guy, is going through a bad patch. I don’t know when he’s gonna turn it on. I was pretty reserved on that one. I just wanted to get a medal. I didn’t care what color, but I should have gone for the gold in that one. LRC: Yeah. That’s right. I think of you medaling, and de Lima getting attacked, I forgot that Baldini actually won the race. 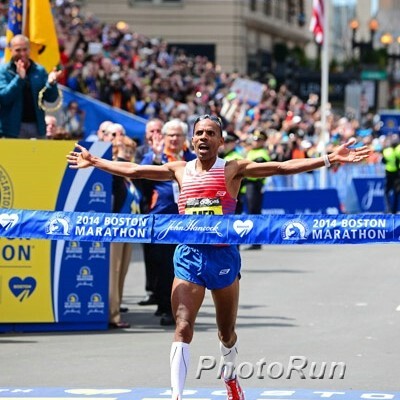 Meb Keflezighi: Its an even bigger, or another story for the movie or the book, right? LRC: Yeah. Even that … just make a movie on that thing. Meb Keflezighi: Yeah. They were trying to, actually. I signed something that they were gonna try. I don’t know where it went, but they were planning on making a movie on it. LRC: You should start your own publishing house and movie studio. We’ll get all the movies and books that we want. Who was your favorite person to race against? Meb Keflezighi: Who … favorite person to race against? Abdi and Culpepper has been very great in the 10k. LRC: Alright, good, that’s my generation. 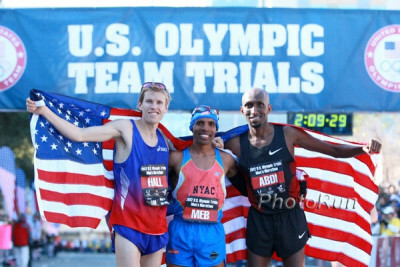 Meb Keflezighi: That was “The Big Three’. We call that The Big Three. Marathon, it varies, because its not every six months or whatever or every three months. I always look for a challenge. I wanted to run against Haile in his “a” game. He was my idol. People, they see me grow up in high school, they competed against me and they wanna [beat me] … Scott Smith from Flagstaff, he tweeted something like, “ oh I should’ve paid attention when Meb came out to our high school, now I’m racing him this weekend.” Its kind of fun to be able to be in that realm. 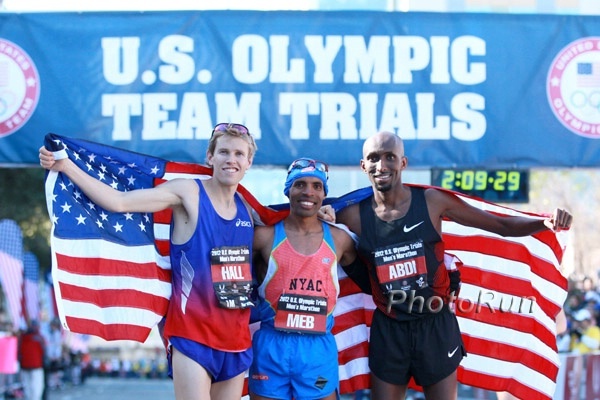 It was fun to run against Ryan Hall, and Dathan in this new era of marathon. Meb Keflezighi: Haile did a little bit in 2010, but he dropped out of the New York City Marathon. LRC: Since you won Boston in 2014, we’ve only had one American under 2:10. What do you thinks going on? You think it’s a problem? What can we do about it? Meb Keflezighi: I think that, personally, from seeing people, they take the easy ways too easy. You’re an elite athlete. Six minute pace shouldn’t be a problem for you. If you’re gonna try and compete 4:30’s, 4:50’s, 1:10 or 1:15 slower than your tempo run, or your race pace, six minute is … I’m not saying that every time you should 5 miles at six minute pace. When I was in a trained group, I would start with them, but, I would end up 9,000 feet … I would go 6:05, 6:10, 6:15. I think being healthy, being consistent, and the coaching is also important. LRC: How closely do you follow the running scene these days? Meb Keflezighi: I do follow running. Not as much as I’d like to, because practicing for speeches, or spending time with the kids. I’m not as active as I should be, but I love the sport. It has done amazing things for me. To be able to just cheer for some people that I wanna cheer for, and send them a text. I get from elites advice on how to do training, or advice on injuries, prevention, and all those things. Its fun to be able to interact with them. When they come back and do well, its very rewarding. LRC: Can you tell us who you’re secretly cheering for? Meb Keflezighi: I’m very excited for the women’s race. LRC: Any dark horses out there? Meb Keflezighi: I think the women is pretty much what it is On the men, its really wide open. It’s really … besides first place, I think it’s really wide open. LRC: You can’t tell us who you’re rooting for, because there’s still the chance of the comeback. Meb Keflezighi: No, I am really, really excited on the woman’s. With Deena Kaster and myself, we hoped to be a good example to bring the US distance running [to the next level]. When we sent only one male, one female to the 2000 Olympic Marathon Team, Coach Bob Larson and Joe Vigil had this idea that they wanted to do something. We’re probably [back] in that era now for the men. Not for the women. The women is … Desi won Boston. You have Shelane who won New York. The other girls are right behind them. Its deep, its really deep. It’s an honor to be able to see them. Some of them do give a notice of how we’ve been an example for them. Meb Keflezighi: On the men’s side, Galen has done his thing, but I think there needs to be another resurgence for men. It’s not as strong as its should. 2020 is around the corner. There’s always somebody coming out of the woodwork, a darkhorse is coming, so we hope for that. I think that some people retire too soon. I think you gotta think long term. I know that pay and sponsorship is difficult. I went eight months without a new shoe contract. I didn’t have, besides [Generation] Ucan, Ucan the sports drink that I had, I really didn’t have anything from January all the way until August [in 2011]. LRC: Really? They were your only sponsor? LRC: Everybody [go] buy your Generation Ucan. They’re an advertiser on Let’s Run. Meb Keflezighi: They’re a great company. I think at the time, maybe even Power Bar did a little bit. It was a tough moment, but, one door closes, another door opens. Eventually at one point, I had close to 13 sponsors, which is an amazing … my goal, when I graduated from college, was to have a shoe sponsor, a watch sponsor, a glasses, sports drink, and a bar, and maybe a car. That was the vision that I had. Coming out. Meb Keflezighi: I wanted a car. I had the watch sponsor, I had CEP compression sock, which I use them every single day. LRC: So, you never got the car? You everything else? Meb Keflezighi: I got everything else, yeah. LRC: How many sponsors do you have now? Meb Keflezighi: Well, I have Ucan, CEP, Maui Jim, Sketchers, KT tape, I think that’s pretty much, I think so far. John Hancock, I’m ambassador for them, but also a new sponsor I just got last week that we announced is 26.2 brewing. It’s the Sam Adams Beer company. Meb Keflezighi: Yeah. 26.2 Brewing is what its call. LRC: Oh, cool. It’s like beer just for runners? Meb Keflezighi: Beer for runners. LRC: Sweet. I’ve been saying we need a beer for Letsrun.com, like an official beer. If they also want to sponsor the website [that would be great], or maybe we’ll just back your beer. Is it gonna be a Meb beer? Meb Keflezighi: We’ll see. We’ll see where that goes. LRC: Well cool. Thanks for taking the time and … where are you off to now? You were saying before we started, you travel more now than when you were racing. How many weeks a year are you gone? Meb Keflezighi: I don’t count them. I’m traveling a lot more. I’m going to Shamrock, the Virginia Beach marathon and half-marathon this weekend. I got the Carlsbad 5,000 soon. Doing quite a bit of speaking engagement appearances. I’m not in one place where … I used to go to Mammoth Lakes for three weeks or five weeks. I’m traveling a lot more. LRC: Wait, Carlsbad, I meant to ask you about that. You’re now part owner of the race, is that right? Meb Keflezighi: I’m part owner of the Carlsbad 5,000, and also Silicon Valley Half-Marathon, which is April 27th or 28th in Silicon Valley. LRC: So is Carlsbad gonna come back and be like what it once was when Mike Long and those guys were doing it? Meb Keflezighi: Yeah, Mike Long, Tracy, Tim Murphy. I used to go there when I was in high school and watch her run. I think that’s the first time I met Steve Scott, the US mile record holder. That’s the goal, with Ashley Gibson [the owner] and myself and John Smith. We’re trying to get it going again. Get some good feels and 5k. Adults can do it, kids can do it, and then for the people that wanna challenge themselves for PR or having a fast time. It’s the fastest marathon in the world … I mean fastest 5k in the world. LRC: – stuff like that, people need. Meb Keflezighi: Its always great to visit San Diego. Carlsbad, a suburb of San Diego and run by the beach. Its great, its out and back. To be able to cheer the other runners, inspire each other and encourage each other. PHOTO: Meb Keflezighi and Ryan Hall with their fathers, Russom and Mickey, after the 2010 Boston Marathon (photo by Chris Lotsbom for Race Results Weekly). LRC: I need to come out. I promise, this is the final question. You said 5k. The 5k is leaving the Diamond League. Any quick thoughts on that? Meb Keflezighi: I love sports. The more we can participate in activities, the better for the young kids, for the elites, and also for elders, who are out there stretching. With the Diamond League, I haven’t read thoroughly, but I heard they’re eliminating the 5k. A big … We’re trying to connect to the regular, average person – what’s the 3k? They don’t know what a 3k is. Is that one mile? Is that two miles? They don’t know. When you eliminate the 5k, I don’t think that’s very wise. When you tell anybody 5k, they know exactly … you know its far, but doable. When you have the world championship and Olympic games, a 5k, personally, I think it should be a part of the Diamond League. LRC: Nobody knows what a 3k PR is. Even runners barely know. Meb Keflezighi: Yeah. You wanna be relatable. 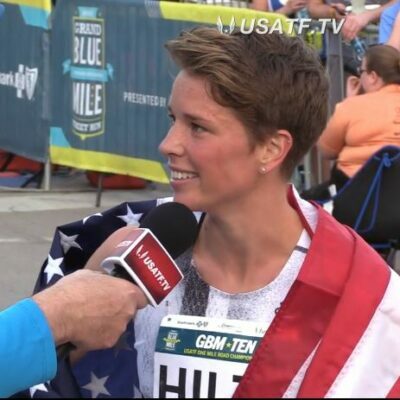 I think … probably marketing and things like that, but when you have very talent-filled men and women out there … A game and the Diamond League are always excited to see if they can break 13 minute or 15 minute for the women. It’s exhilarating. LRC: Well, if they get rid of it on the track, Carlsbad will be the best 5k in the world. LRC: Inadvertently, It might help you. Thank you so much. Appreciate it. LRC: Thanks, that was great. Thank you.